My dad has always been into gardening and I knew that his mum enjoyed growing vegetables too. In fact, she insisted that I got manure onto my plot when she found out about my new gardening hobby. "Get manure, it makes all the difference" she said. Very much a green fingered family! 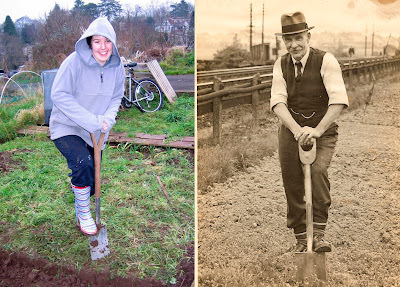 Here is a photo of my great grandfather, James, on his plot which ran alongside the railway he worked on and the very first photo of me on the plot in 2006. A very similar pose! !